Even if you don't get the project, you can still enjoy the process! This was a quick look at an urban rooftop living room and kitchen addition. The building was a three-story masonry construction from 1915 in downtown Raleigh. The existing stairs were in different locations on each floor. So this design re-stacked them for more efficiency toward the rear. And it introduced a skylight above it to filter natural daylight down the dark, north facing rear of the building. 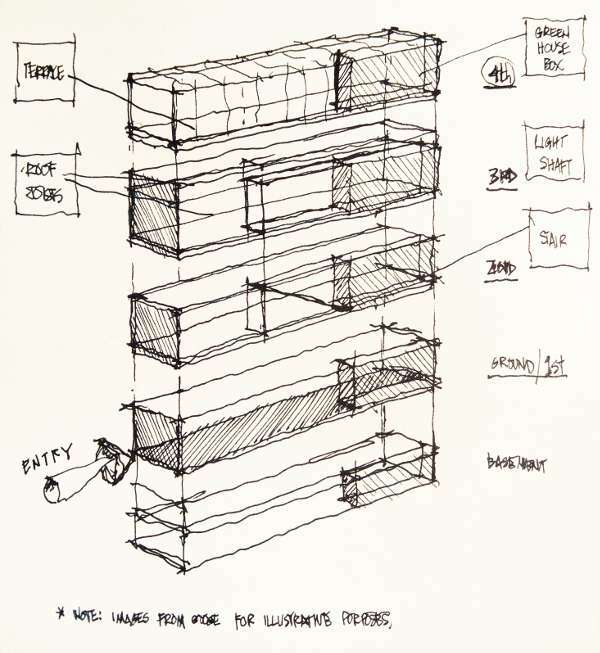 The initial sketch worked out the spacial organization and then a 3D model looked more closely at the forms. This entry was posted in 4D»2B, Code, Sketch and tagged commercial, design, existing, massing, renovation, residential, sketch on 2017-02-16 by Steve Hall. Modern architecture is fundamentally about technology. The industrial age ushered in new materials, science, math, and tools to enable humans to create power grids, ocean liners, airplanes, and highway systems. In architecture, technology resulted in steel structures, large sheets of glass, wood studs, plywood, indoor toilets, heating systems, and electric lighting. This was further refined in the middle of the 20th century with significant improvements in insulation, less hazardous paint, non-toxic plumbing, air conditioning, more efficient lighting, and the internet. So why, now in an era where the world's fastest car is electric, do we still want to reference historical technology? I believe primarily this is because we disconnect architectural features from their relationship to technology. The sketch above is one of my typical five minute explorations. This is exploration for an actual house in Raleigh where the client is interested in traditional detailing. 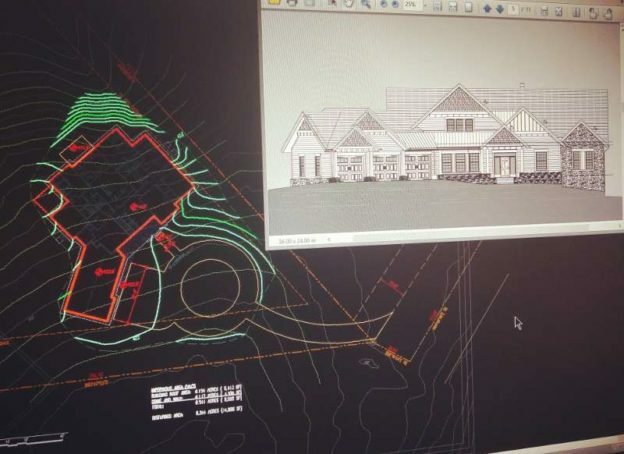 The challenge is to create historically accurate references even though the home is built with construction methods fundamentally removed from the technology that evolved those details in the first place. Can this even be done? Should it be?! As with any historically linked design, I start with a model. The 1740 Drayton Hall outside of Charleston, South Carolina, is the model for historical southern architecture. (Google image search for a lot more views.) There are also some Neo-classical models around, but Georgian is the first mature style of architecture in the south although few great examples exist like this one. In the sketch, I began with Drayton Hall's basic form. The primary mass is a rectangle and the roof form is hipped with a gable only on the front. But that's the extent of progress when logic starts to break down. Drayton's roof is actually double-hipped, with two different slopes. Notice in the far right of the sketch, an illustration of a roof kick. Maybe that is a way to suggest the double-hip without the complexity? There is also a suggestion of synthetic slate. Although it is currently metal, Drayton's original roofing material was likely clay tile or slate. (Metal roofing wasn't used in America until the 1800's, when Drayton was re-roofed.) Modern slate roofs are rarely repaired with stone. They use a simulated phenolic slate that is lighter and has a 50 year warranty. 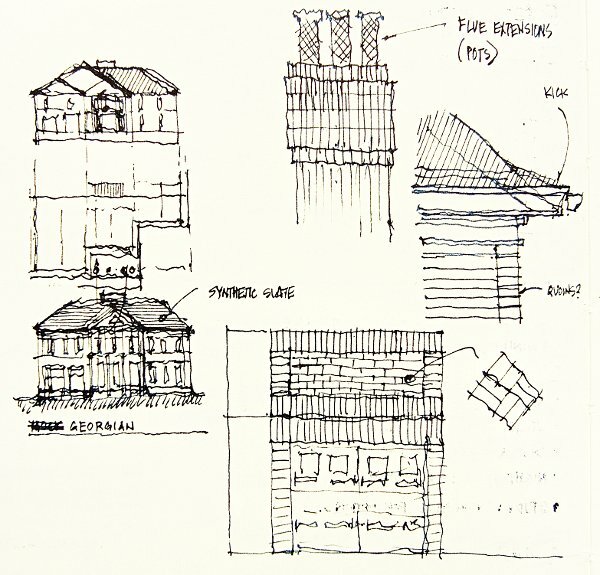 Also indicated in the sketch are quoins. These are vertical blocks defining masonry corners. They were used to define and stabilize masonry structures as far back as Rome. But today's masonry is effectively glued onto a wood framed building. Our codes don't allow brick to support a building so it is conveniently pasted onto the outside. There is no functional necessity for quoins. The upper sketch also indicates flue extensions (pots). This is the classic English historical look, but Drayton Hall never had them. Finally, notice the bottom right corner sketch--a garage door! Obviously fitting such a large scale opening into an historically derived building looks pretty ridiculous. Without steel and modern glass manufacturing techniques, 18th century windows were very small. The architecture didn't give voice for large openings. You can see in the lower left sketch that two garage doors are fitted in on the building left. But the historical building had nearly a full story of stairs up to the finished floor. It also has a downstairs cellar. Neither of these are conducive to our modern needs for drive-in garages and walk-in level main floors. In a few minutes, the sketch highlights numerous difficulties with historical reference in current construction techniques. I'm not convinced it can properly be done. I'll write another article if the project takes off and we can successfully accomplish it. For more information on authentic historical architectural styles of residential buildings in America, see A Field Guide to American Houses (Revised), by Virginia Savage McAlester for a thorough catalog. I have the original edition, but the revision is even better. 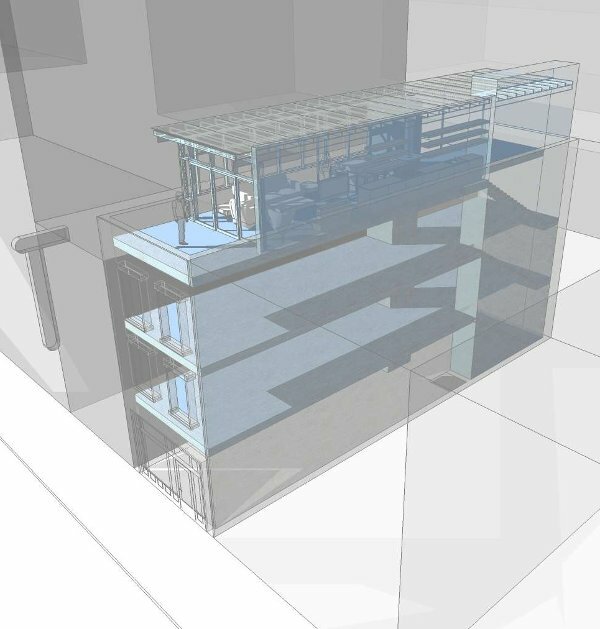 This entry was posted in 4D»2B, Sketch and tagged detailing, historical, residential, sketch on 2017-02-09 by Steve Hall. This sketch is pretty typical of my usual process: Multiple ideas and scales derived simultaneously. This keeps formal and material explorations coordinated and sensitive to the other. First, in the upper left corner, there are two circles bisected by lines. If you look carefully, you'll notice that the left-most line is a simple dot-dash, the architectural symbol for center line. This represents the figural core of a thing, essentially its idealogical center. You can't actually see the center of a material, but we humans like to align materials by their center of being. The second line, to the right of the first, is a double dot-dashed line. This is the symbol for property line, and represents the edge of a form, space, or property. We can touch this face and use it to define how big things are and when they touch. Farther right, just past the middle of the sketch, you'll see these two line types expounded in a simple grid with two rectangular columns. See how these two line types are used? The center line (in the middle!) bisects the two columns while their edges are defined by the property line type. Architecture is a constant play of idealogical alignment and physical material alignment. Our mind perceives beauty when forms are visually aligned. A series of exposed columns is aligned by their centers along a idealogical grid line, as in a Greek arcade or medieval cathedral nave. But columns are rarely all the same size. Lower ones are bigger and upper ones smaller. Interior or exterior columns often differ in size. And most steel H columns have a major and minor axis which rotate depending on how they resist the building's bending in various directions. Simply aligning these can be difficult, but it becomes exponentially more difficult when attaching facades. 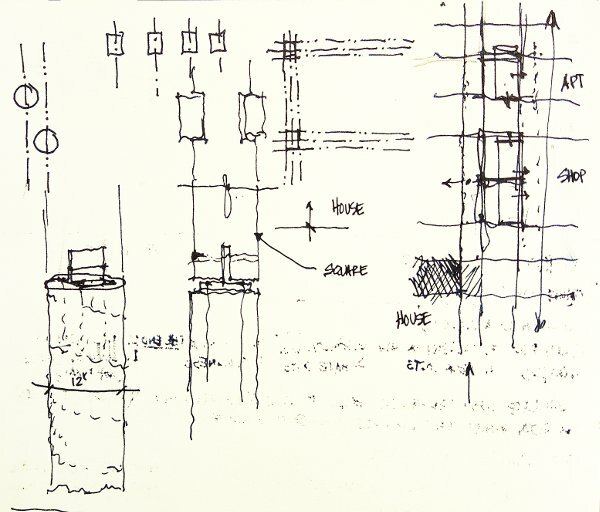 In this sketch, I was discussing a wood post-and-beam house and how its enclosure might work. You can even see some large scale spacial exploration within the same grid in the right-most portion of the sketch. Finally, the lower left is a detailed look at the actual materials. This is a concrete footing pier for the timber frame above. A steel "T" connects the wood post above to this foundation form below. Although a little series of exploration sketches like this might take just a minute or two, they may make key decisions that drive an entire project! This entry was posted in Sketch and tagged concept, design, detailing, residential on 2017-02-06 by Steve Hall.